Low Yow Edwin, photo, Chinese Exclusion Act Case Files, RG 85, National Archives-Seattle, Seattle file Box 783, #7030/11920. Rhonda, one of National Archives at Seattle’s volunteers, has been looking for documentation on her Chinese/Native American father for years hoping to prove his Native American heritage. 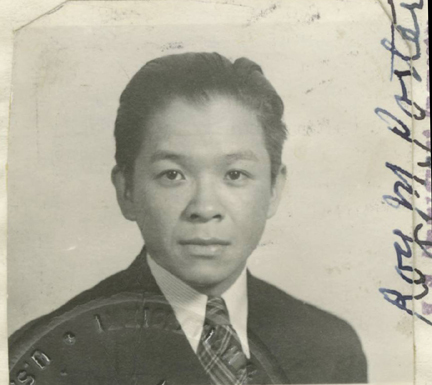 While processing records from the Chinese Exclusion files, Rhonda came across a case labeled “Low Yow Edwin” and checked to see if it could possibly be about her father. Her father, Edwin Law Yow, was a mechanic for the Flying Tigers during the World War II. Before he enlisted he applied for permission to travel abroad, and during the application process his stepmother, Mrs. Law Yow, and other witnesses were called to testify on his heritage. Listed below is his and his stepmother’s testimony where she speaks of her husband’s deathbed confession—just the information Rhonda had been seeking. The interrogation also references a birth certificate in Alaska. The Seattle file also lists a National Archives at San Francisco file number. Rhonda quickly emailed a request for the search. John Seamans, Archive Technician, at the San Bruno facility found the file. It contained the birth certificate for Low Yow Edwin! 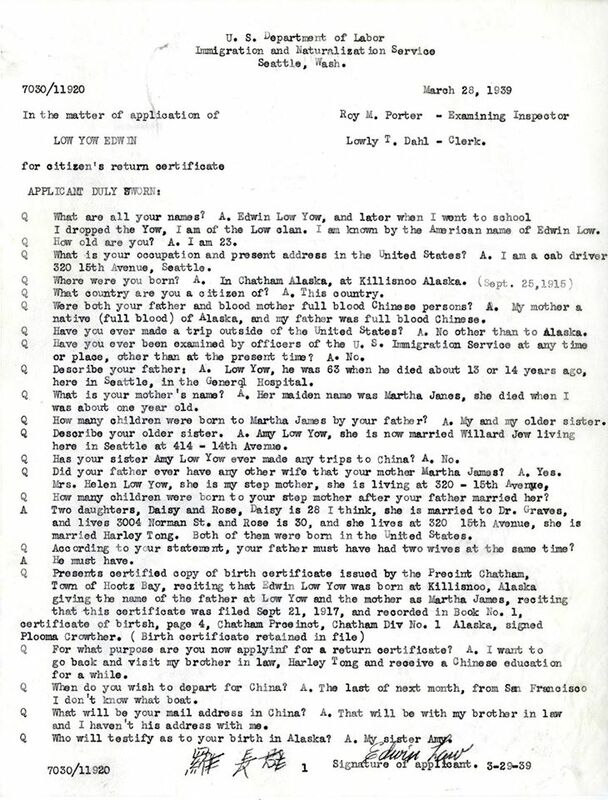 Low Yow Edwin, Application for citizen’s return certificate (1939), Chinese Exclusion Act Case Files, RG 85, National Archives-Seattle, Seattle file 7030/11920. 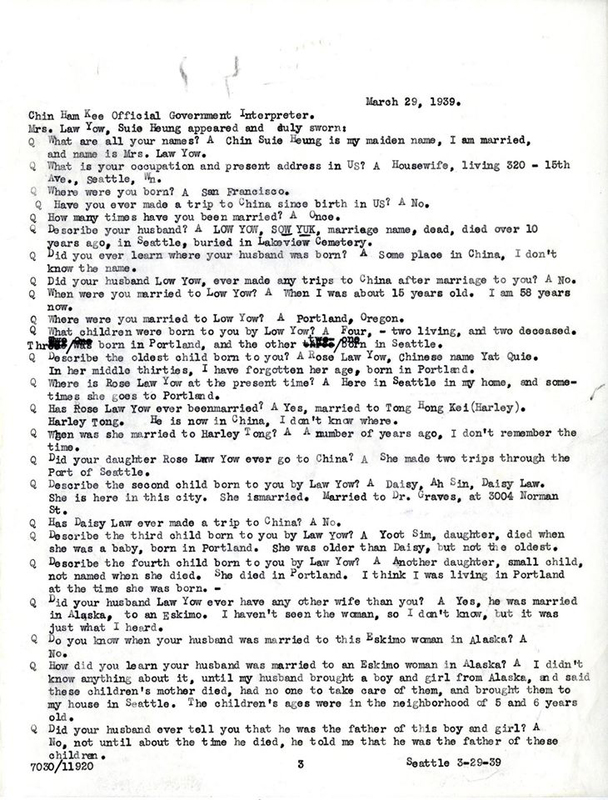 Low Yow Edwin, Mrs. Law Yow (Chin Suie Heung) Interview (1939), Chinese Exclusion Act Case Files, RG 85, National Archives-Seattle, Seattle file 7030/11920. Yep Fay, Certificate of Residence, 1 August 1917, Yep Sue case file; Chinese Exclusion Act case files, RG 85, National Archives-Seattle, Box 749, Case 7030/10751. Yip Fay was Yep Sue’s father. His Certificate of Residence #49999 was included in Yep Sue’s file. The certificate had pale green ribbons and a gold seal. 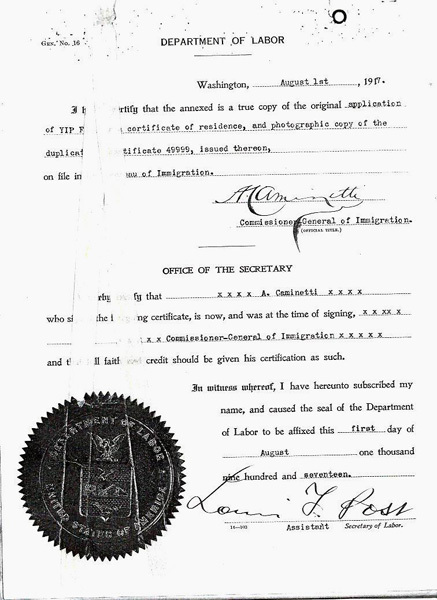 It was signed by A. Caminetti, Commissioner General of Immigration and Louis F. Post, Assistant Secretary of Labor. 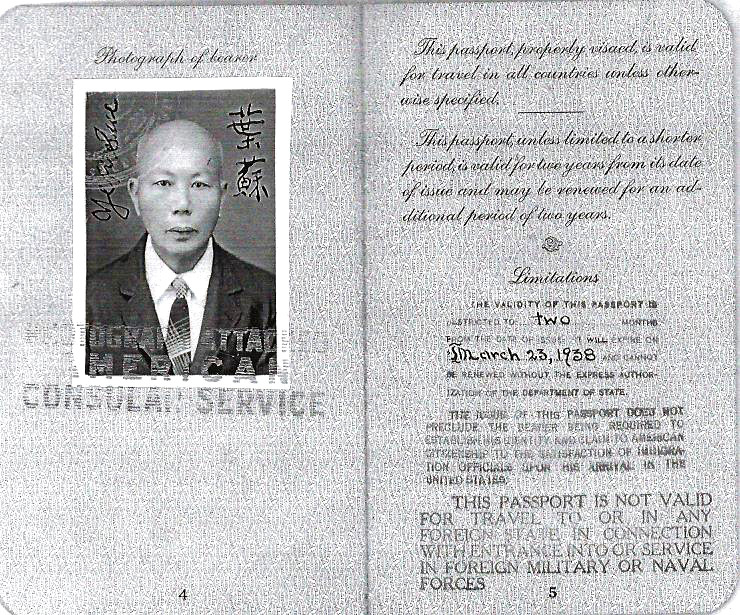 Yep Sue Passport, page 4 & 5, 23 March 1938, Yep Sue case file; Chinese Exclusion Act case files, RG 85, National Archives-Seattle, Box 749, Case 7030/10751. The passport was valid for two months and could not be renewed. 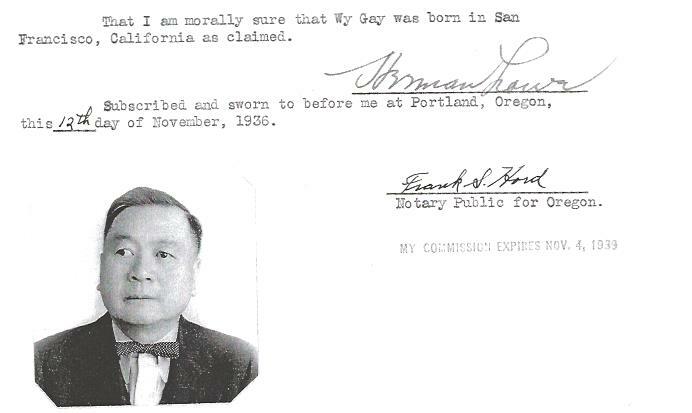 Herman Lowe Affidavit, 12 November 1936, Portland, Oregon, Gay Sic Wy case file; Chinese Exclusion Act case files, RG 85, National Archives-Seattle, Box 719, Case 7030/9718. Gay Sic Wy, born 10 November 1894, San Francisco, CA, was working as a U. S. Postal Clerk in Oakland, CA in 1936 when he applied for a native’s return certificate, Form 430. His birth had never been officially recorded. He presented an honorable discharge from the U.S. Army which showed that he was born in San Francisco. Affidavits on his behalf were presented with photos by his uncle, Herman Lowe; Herman’s wife, Mamie H. Lowe; and his mother, Lo How. Herman Lowe was an official interpreter for U.S. Immigrant Services. Gay Sic Wy’s application was approved. 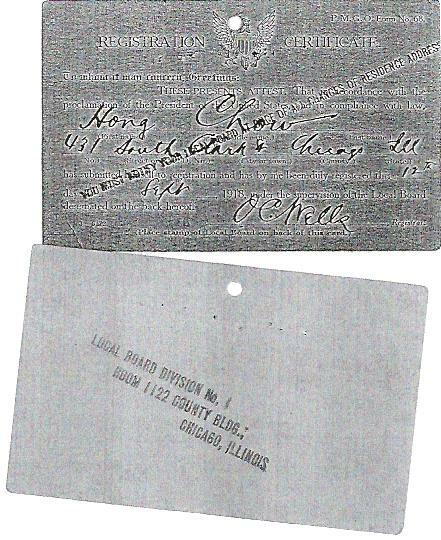 Hong Chow’ file shows that he was born in San Francisco about 1874. His most recent entry to the U.S. was at the Port of Seattle on 17 October 1930 on the Princess Marguerite. He was living in Pocatello, Idaho at that time.